Blogging is still very alive, and it already appears to be one of the best ways to build a profitable business online. 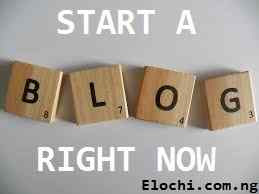 Starting a blog is now easier than ever. However, people are still skeptical about whether it is worth the investment. Maybe you're not sure if you're cut out to be a blogger or maybe you're not aware of the many benefits of starting a blog. Well, that will change in a few moments now. Get yourself some coffee as we flow along, then relax and make yourself comfortable as we go through this post carefully. Do You have to be a Writer to start Blogging? One of the main reasons why many people are still doubtful to start up their own blog is that they believe that writers are the only ones who can blog. This is not true. All you need is a wish for your knowledge and the ability to share your thoughts in words. In fact, most successful bloggers today started this way and developed their skills over time. If you have a product and want to use your blog to increase your search traffic, there are many ways to hire a freelance writer. Many went as far as to complain of no cash to setup their own blog including buying of custom domains, hosting, designs and others. Nevertheless if no cash yet, here is a comprehensive guide on how to get free domain for blogger and how to integrate into your blogger dashboard easily. With this, your blog is up and set. Now its time to write your articles and make up contents of good quality and one that can add a value to your readers. Start with the little you can and write on that which you have passion for, or better still get a niche and then explore your knowledge on that by making up nice posts on your blog. If you still wonder why you have to start a blog, here are a few reasons to consider. READ ALSO: "The Untold Secret of Blogging"
Blogging is an excellent way to build additional revenue streams while keeping your career. You can start a blog like a startup and grow without having to take significant risks. The first step in generating an income stream is to get visitors to your website. Focus on having a content strategy game plan. Schedule the topics you are about to blog and write frequently. Many bloggers think they can just write great content and visitors will come looking for it. While this may be the case for some, it does not always work, and sometimes content can be ignored. If you have made an excellent blog post, your content needs to be promoted. It's incredible what $ 5- $ 10 per day can do for Facebook ads for the visibility of your content. Creating the perfect headline is also important for social media engagement and SEO. There is more than one way to earn in a blog. That way, anyone can benefit from blogging, regardless of your niche. • Sell Advertising Space: Programs like AdSense make it easy to place ads on your blog and start selling some advert space aswell. • Use Affiliate Marketing: Amazon is one of the most popular affiliate marketing programs, but it's not the only one. ShareASale is another favorite affiliate program and many others even some domain registrars offer such programs. • Sell Your Products: You can create eBooks, video courses, or apps. If you sell software as a service, you can create a webinar that weighs and give your potential customers more information. A live chat feature is also recommended to sell your product faster by answering questions on-site. • Building Membership Sites: Some of the best membership sites have both a free version and a premium version. If you choose a WordPress theme, see if there are some with a built-in Sign up and login portal for member registrations. • Provide Advice: You can make different plans for the different services you offer and provide free information for 15 minutes. • Do Public Speaking Gigs: Add a "Contact Me" page where you market your skills as a speaker, speak videos of you and the topics you are dealing with. Sign up for The Morning Email. Wake up to the most important news of the day. Believe or not, emails are more effective to generate revenue than blog posts, websites, and even social media. According to a McKinsey report, email delivery is 40 times more efficient to acquire new customers than Twitter and Facebook combined. But where do you find subscribers? An excellent way to grow an email list is by blogging. Use your blog as a platform to promote your email list by converting your blog visitors to leads. You can do this by testing A / B from different email forms. When you publish extensive content on your blog, people will receive your latest posts via email. To create good content, take note of what your readers are asking. Is there a common question they have? Answerthepublic.com and Quora are both excellent sources for finding ideas based on issues that people ask. Once you have a large enough email list, you can use it to promote your products, sell affiliate products and do more. Perhaps, Email Marketing is the deal by providing you with premium email templates and free newsletter templates. READ ALSO: "How to add Google custom search to blogger and make money"
Blogging is a great strategy to promote your business and products and will also help you build your business by increasing brand awareness with every blog post you make. This means that your website will boost the search engine ranking while driving more traffic to your site. It's best to blog every day, but not everyone has the time to blog often. If so, choose some days or when to blog a few times a week to maintain quality. Think about blogging as a long-term marketing strategy for your business with the highest ROI. After all, investing a small amount of your time is all that is needed to start a blog. If you make money and promote products, it's not your goal, and then you can start a blog with the purpose of sharing your knowledge with others. Whether it's politics, video games, movies, success, or even your experience with a disease, you can use your blog as a channel to express your ideas and inspire millions of people around the world. Blogging will also help you build your trust as a professional. By advising on the topics you know, you can build authority and make yourself an expert. Once the world begins to recognize you as an influential figure, you can start with requests for public speaking, coaching and consulting. Yes blogging provides a better lifestyle habit which has some health benefits in addition to the obvious benefit of being an internet expert with people who hang on your every word and actions. Blogging requires a lot of things: Time, devotion, patience, commitment, discipline, and basically all the characteristics/qualities of a fantastic human being. Knowing this fully well, and apply to your blogging life, it will help you develop those skills through a schedule that you create for yourself. However, you’ll start getting a better sleep, you’ll wake up and make the most of each day the best for you, and you’ll have opportunities to become healthier and live as a wealthy person. Most bloggers spend their free time doing some exercise, running, working out, spending time with their families, and doing all kinds of healthy things because they’ve learned how to manage their time and thereby squeeze the most potential out of each day. Starting is the hardest to do something new. If you're willing to take those few steps as listed in this post, you'll see how rewarding blogging can be. It will be the smartest investment you will ever make. READ ALSO: "How to create blogger blog favicon image"
Finally, i know you found this post worthy; Do not forget to drop your comment below and subscribe to our blog feed for more fresh updates like this. Also, share with your friends using the social media buttons below, remember that sharing is caring. A blog helps to build relationship with others as you'd be adding value all through. Am glad you are here, thanks for your kind comment. indeed blogging has helped me in building strong relationships all through, and such has been helping me. thank you once again, have a nice day! Thank you for being here, indeed blogging exposes one to so many things in life and helps you to grow aswell. Thanks buddy. Have a nice day. Welcome to my blog, Am glad you are here, Always visit this blog for more fresh contents and updates like this. Thanks for coming.. Am glad you are here, always visit here for more fresh updates. Nicely written up. As a new learner I must say your article will help a lot to understand the things quickly. Great article indeed. Am happy you are here, thanks for your kind comments. Am glad for your kind comments, always visit this blog for more fresh updates and posts like this. Great post, I enjoyed and learn something new from your blog. Keep it up! Am glad you took that bold step, indeed blogging is fun. Nice having you here aswell. Welcome Rabin, nice having you here. keep visiting this blog for more fresh updates like this and remember to share with your friends.